we have prospered because of our "can-do" ingenuity. and all of our growth has come from Word of Mouth. This advertising display was crafted by the Bogie family in the 1950's. Made from sheet metal which they cut, folded, and formed, the front is back-painted artwork on glass. The window and drawer were mechanized and the light added to bring drama to the display. An original advertising display for SlipIt. It was a hot, sticky summer in Queens, New York in 1939. My uncle, John Bogie, was the superintendent of a large apartment complex and the residents were complaining. Their windows were sticking, their drawers wouldn't slide, and their doors weren't opening or shutting easily. Something had to be done and since there was no "product" to buy Uncle John formulated his own. The first batch was actually "cooked" on his kitchen stove. 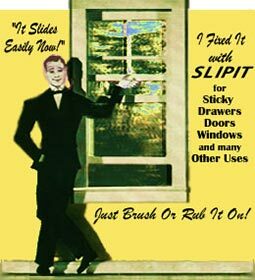 He then applied what was soon to be "SLIPIT" to all the doors, drawers, and windows, even the elevators. No more complaints. The formulation worked so well that he decided to produce and sell it. He didn't know it then, but John had developed one of the first modern, effective, nontoxic lubricants in America. Because of its general lubricating properties, the number of uses for SLIPIT grew rapidly. In 1940 Otis Elevator started using SLIPIT Sliding Compound and it remains a sturdy customer to this day. The other leaders in the elevator maintenance industry were also early SLIPIT customers. Since then we've added many loyal customers in the trucking, overhead door, woodworking, and a variety of service industries. Our list of corporate customers includes names ranging from Pennsylvania House Furniture and Ritter Manufacturing to the Chicago Transit Authority and Storage USA. Over the years we've changed the design of SLIPIT cans, improved the formulations, and added new products. At one point, in the early 1970s, we even created some indoor product counter displays for our loyal retailers. I actually helped Uncle John build these in our Highland, New York facility. Uncle John was an average American guy who developed a product when he saw a need. 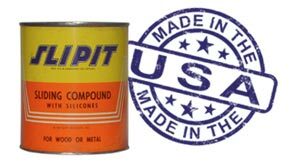 There are certainly bigger lubricant manufacturers but we at SLIPIT are proud to not only carry on the tradition but also proud to be a small business in America. Paul J. (Joe) Bogie, Jr.
For a more updated view-from-the-bridge, hear from our President ...click here.